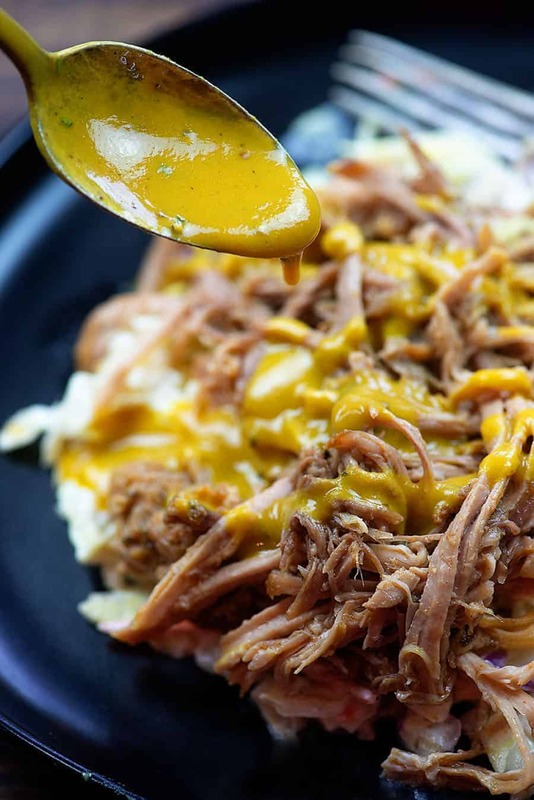 Mustard BBQ sauce is my favorite low carb BBQ sauce recipe! It’s simple to throw together and it is positively delicious served over pulled pork or grilled chicken. My husband bought me a smoker for my birthday this year. Partially because I clearly enjoy cooking and trying out new things, but partially because the man is downright obsessed with pulled pork. 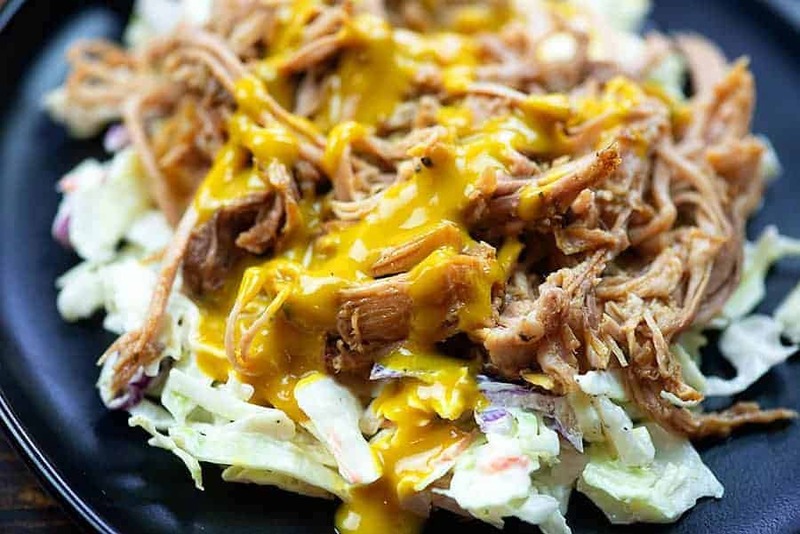 He piles low carb pulled pork on his plate, tops it off with some keto coleslaw, and goes to town . We’ve purchased the low carb bbq sauce in a bottle from the local grocery store and it’s pretty good, but I knew I could do better at home. Hi, here I am. I brought you some of my favorite low carb barbecue sauce! 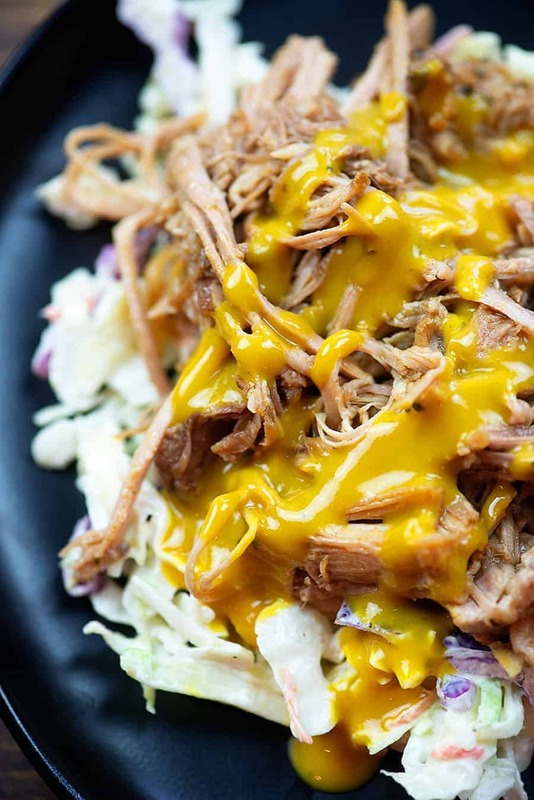 If you’ve never had a mustard BBQ sauce before, you’re in for a treat! Traditionally, barbecue sauce starts with ketchup or tomatoes and a whole lot of sugar. Tomatoes are already fairly carb-y and then adding all that sugar just makes traditional BBQ sauce totally not low carb friendly. 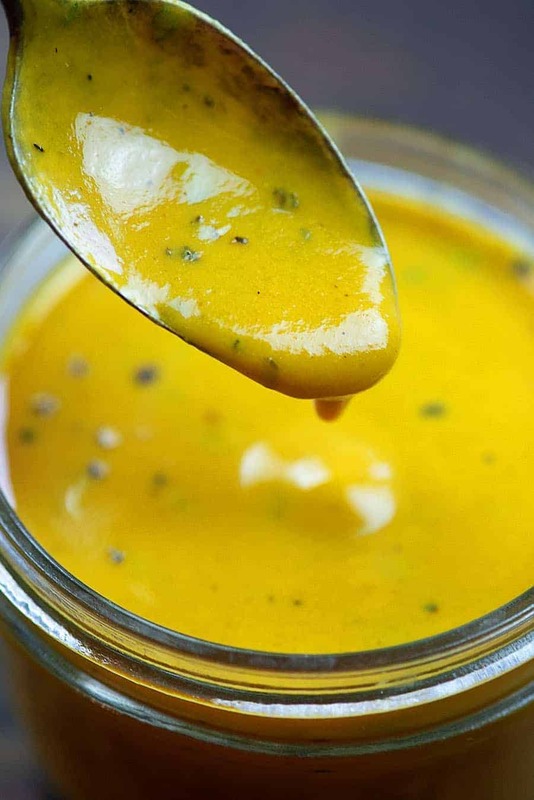 Starting with mustard solves that problem nicely and makes for a really unique, boldly flavored, tangy, semi-sweet sauce. The flavors all just explode in your mouth! We’re going to start by placing a pot on the stove and filling it with all of our ingredients. This is a mustard based BBQ sauce, so we’ll start with an entire cup of yellow mustard. I’m just using ballpark style American yellow mustard. You’ll also add in some chicken stock, apple cider vinegar, your favorite sugar substitute, a spoonful of molasses, Worcestershire sauce, cayenne pepper, salt, and loads of freshly ground black pepper. For this low carb barbecue sauce, I’m using my favorite brown sugar substitute: Lakanto Monkfruit Sweetener. To me, it tastes just as good as brown sugar. No weird aftertaste or cooling effect and 0 net carbs. Bring your pot of ingredients to a boil, reduce to a simmer, and cook for about 10-15 minutes. You want the sauce to reduce a bit and thicken up. Give it a taste and add more salt, pepper, or cayenne, depending on your preferences. Fathead Pizza: This is a staple in our house – the crust is perfect with any toppings, but it’s extra good for BLT pizza! Low Carb Crackers: Sometimes you just need something crunchy to munch on! Cauliflower Salad: You won’t even miss the pasta, promise. Keto Ranch Dressing: Another staple that we always have in the fridge! 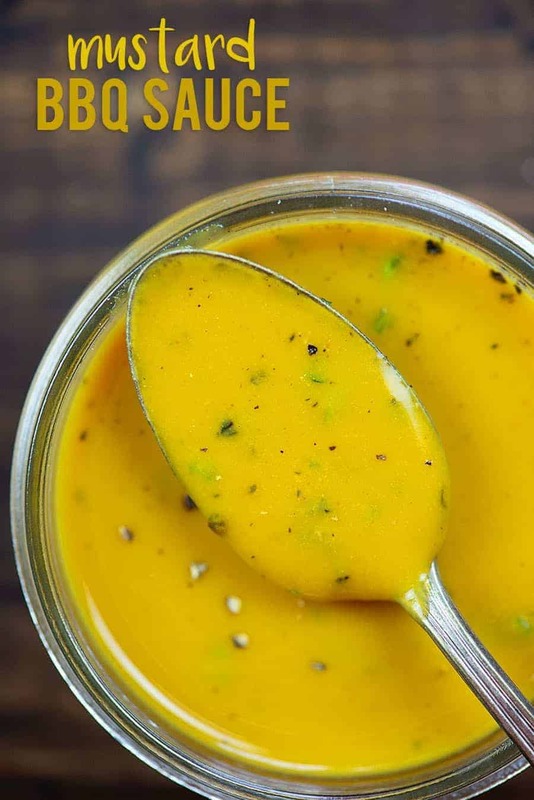 This low carb sauce is tangy, bold, and perfect for topping your pulled pork or grilled chicken! Add all ingredients to a 2-quart saucepan over medium-high heat and whisk to combine. Bring liquid to a light boil, then immediately reduce heat to medium-low and simmer for 10 minutes, stirring occasionally to reduce liquid by one-fourth, or until desired consistency is reached. Taste for seasoning and add more salt, pepper, or cayenne as desired. 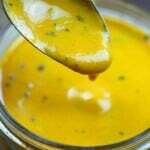 Store unused sauce in a mason jar or other tightly sealed container for up to one week. Perfect, Karly! I can’t wait to make this. By the way, my husband loved the radishes, I thought they were great too, but I kept wanting them to taste like potatoes, even though I knew they wouldn’t/couldn’t. Can someone please make a potato without carbs, please Lord!!! 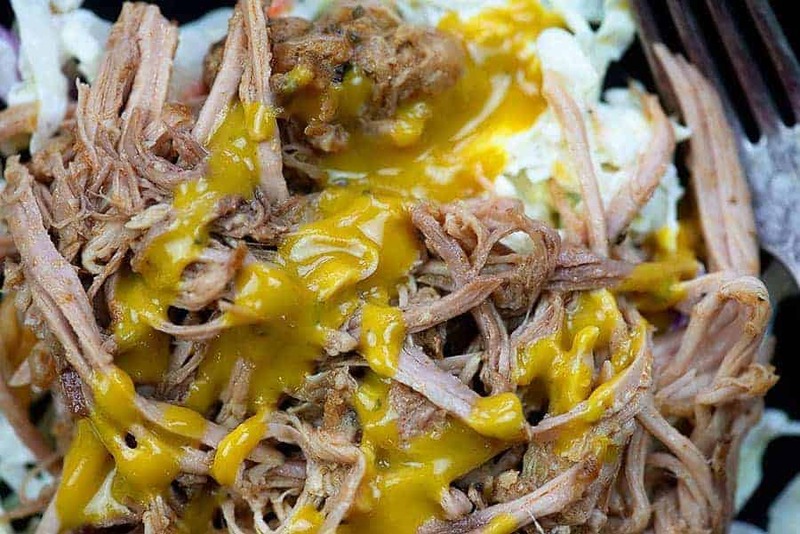 This mustard BBQ sauce is so good, Karly! I served it with Cajun smoked spare ribs and my husband devoured them! This is delicious!! Thank you. I am not even sure what I will serve it with yet, but I love mustard and made it as soon as I saw the recipe. Made this today using the juices from the crockpot… omitted the sweetener & molasses, just because sweetener seems to do funny things to my body & stalls my ketosis. Nice tangy mustard! Perfect with the pork. Thank you! Could I possibly use Yacon syrup instead of molasses? Just trying to use what I already have in my kitchen. I haven’t tried Yacon syrup before. If it’s very sweet, you might just reduce the sweetener a bit. It should work fine though! This looks awesome and i’m excited to try it, but I am curious why you specify to NOT use blackstrap molasses? The flavor is a lot stronger and more bitter. How many grams of sugar it has per serving? This stuff is really good! After tasting, I added a quarter or half teaspoon of white pepper (eye-balled it) and a teaspoon of tarragon to deepen the flavor a bit. I do think that adds to it, but it’s fantastic as written.